I ordered and paid for my fur rug on Sunday and received it Weds. Germany! Lovely natural rabbit fur blanket - "rabbit-colour". A dream of a fur blanket, which ensures a comfortable living environment. Order now online for even more coziness and relaxation at your home. Made from farmed German rabbit - Of course, we can make this rabbit fur blanket in any size you wish. Brown fur throw made of rabbit skins. Soft, cozy and durable fur throw made of light brown rabbits fur for a comfortable living ambiance. Have look at this fur throw now and learn more about our real fur blankets. Discover our rabbit fur throw "Chinchilla Style" - natural, gray color with lighter, white sides. Add a touch of luxury to your home or workspace. This fur blanket can also be produced in a customs size. Order now online. This rabbit fur blanket in multi-color has very silky and soft hair, and the underwool is incredibly soft & warm. Explore our real fur blankets. Rabbit throw in the grey-black with catprint in size 200 x 145 cm (= 2,8 sq m). In our Online-Shop you could find more, exclusive rabbit throws and other fur blankets. Beautiful sheared Rabbit Fur Rug - Of course we can make this fur rug in any size you like. Rabbit throw in purple-white made from soft rabbit skins. Manufactured in a simple and elegant color mix. Learn more about this fur throw now. Extravagant real fur throw made with first-class rabbits. Modern color-mix with white, black & purple. Convince yourself of our fur throws. Colour: black - Lining: black wool fabric - Of course we can make this blanket in any size you'd like. Amazing fur blanket made of natural german rabbit skins. Ready to ship today! Beautiful fur blanket made with rex rabbit in baby blue makes dreams come true. This real fur blanket ensures a warm living ambiance. Learn more now. Noble real fur throw made with rex rabbit in midnight for a luxurious interior design. Beautify your home and this real fur throw now online. 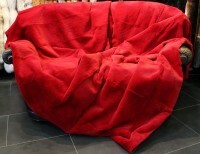 Sheared rabbit fur blanket in red. The sheared rabbit fur blanket is lightweight, soft and breathable. The fur blanket is perfect for year-round use. Order this beautiful fur blanket now in our online shop. Rabbit Fur Blanket in dark brown - This rabbit fur blanket is available in every size. Red rabbit fur blanket with a beautiful red color and a super soft feeling. Each of our fur blankets adds an elegant charm to your surroundings. A splash of vibrant, contrasting colors to add the extra touch of luxury to your home.